China has been a cultural marvel for the past 5,000 years, beginning with their discovery of the silk worm during the Neolithic period (4th millennium BCE). Chinese artisans wove the most amazing textiles and introduced robes with intricate handcrafted embroideries that, to this day, provide a wealth of inspiration. 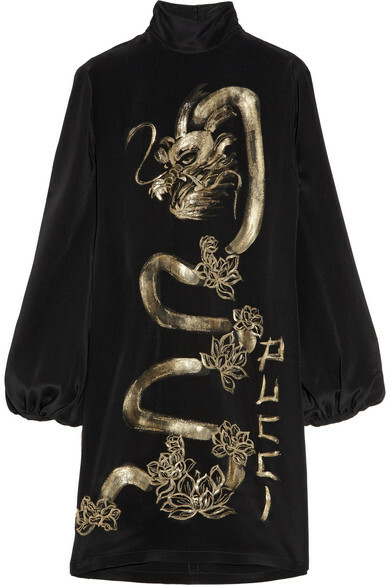 Over time, Western designers began incorporating Chinese cultural symbolism into their designs: the philosophy of Confucius, Chinese calligraphy and porcelain, Imperial Chinese dynastic robes featuring embroidered dragons (a symbol of power), the martial arts of Tai Chi and Kung Fu, Chinese medicine and food, and of course, the Great Wall. After the Chinese national revolution of 1911, the country began to accept a more “modern” form of dress. By the mid-twentieth century, the tight-fitting dress known as a cheongsam or qípáo, became traditional women’s dress and the “Mao suit,” a modern revolutionary garment, often made in blue cotton, was the expected attire for men. Subsequently, when we visualize Chinese or Chinese-inspired clothing, we imagine large dragon motifs, dense floral embroidery, including lotus and plum blossoms. Works of calligraphy paired with red geometric borders and China porcelain art comes to mind. With time, Mandarin collars, Mao jackets and frog closures also found their way into Western designers’ collections. Let’s take a look at some of the best and most popular examples of how Western designers used exoticism, borrowed from the Far East, in their collections. 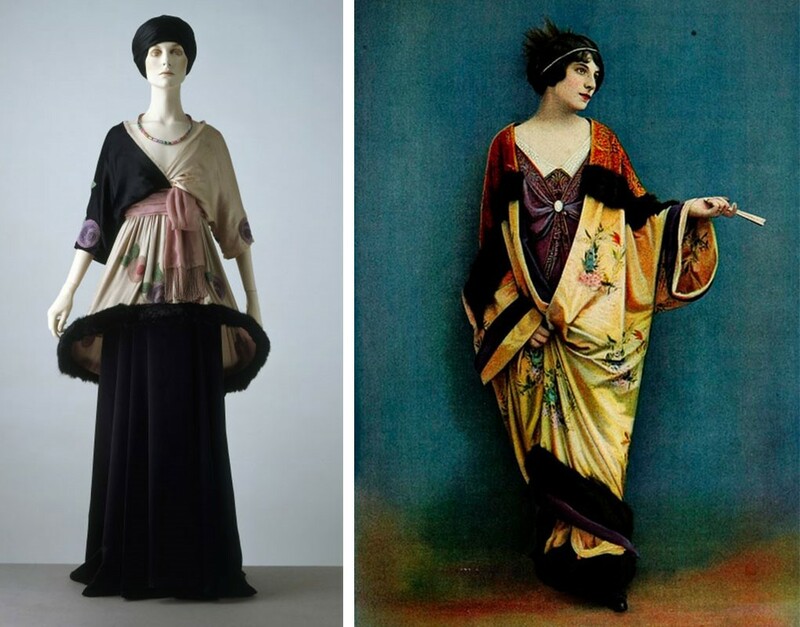 French designer Paul Poiret was highly influenced by Chinese fashion with his famous ‘lampshade’ dress and embroidered Chinese-inspired robe from 1912. 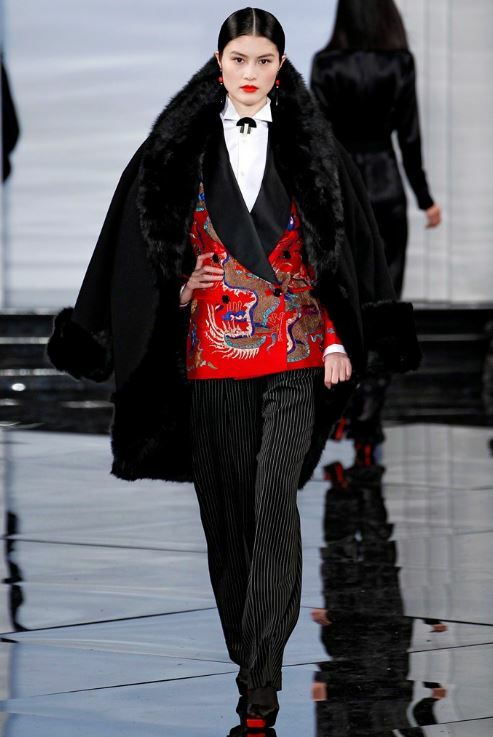 In his Fall/Winter 2004 ready-to-wear collection, Tom Ford designed his version of the Chinese cheongsam or qípáo, with added sequins and a side draped detail. 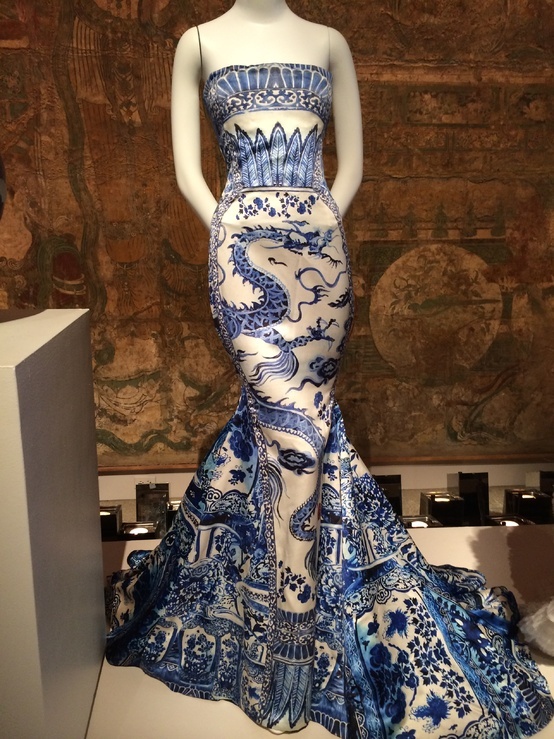 Roberto Cavalli’s Fall 2005 ready-to-wear collection showcased this silk gown with a Chinese blue and white porcelain pattern. 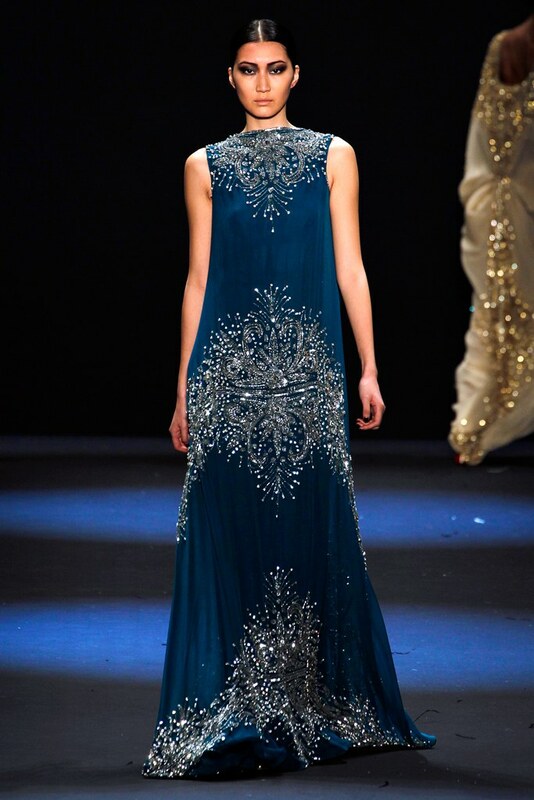 Designers continued to channel China in the Fall 2011 collections of both Ralph Lauren and Naeem Khan. Khan was inspired by the book The Silk Road. 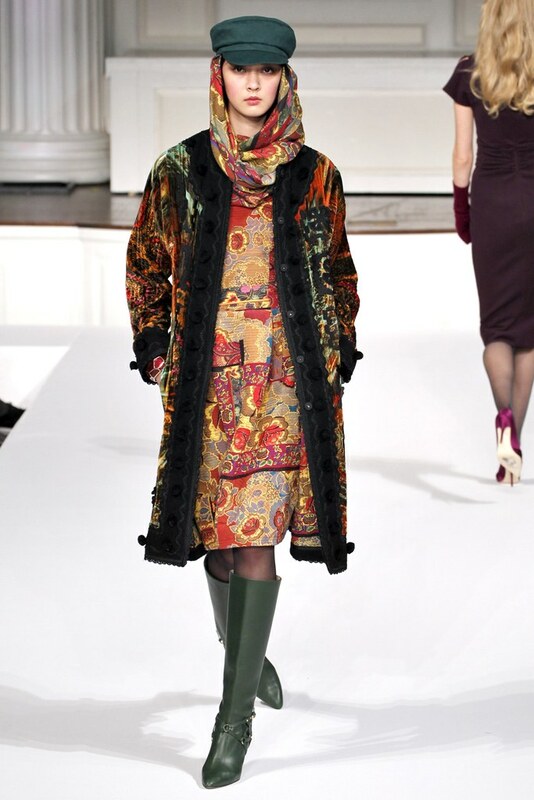 Far Eastern influences continued as a trend that same year as Oscar de la Renta featured ornate Chinoiserie patterns on coats and silk dresses. 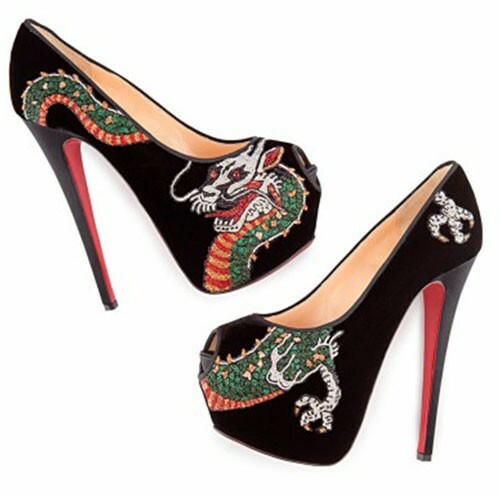 Christian Louboutin brought Chinese inspiration to accessories, with his dragon motif pumps and flats. 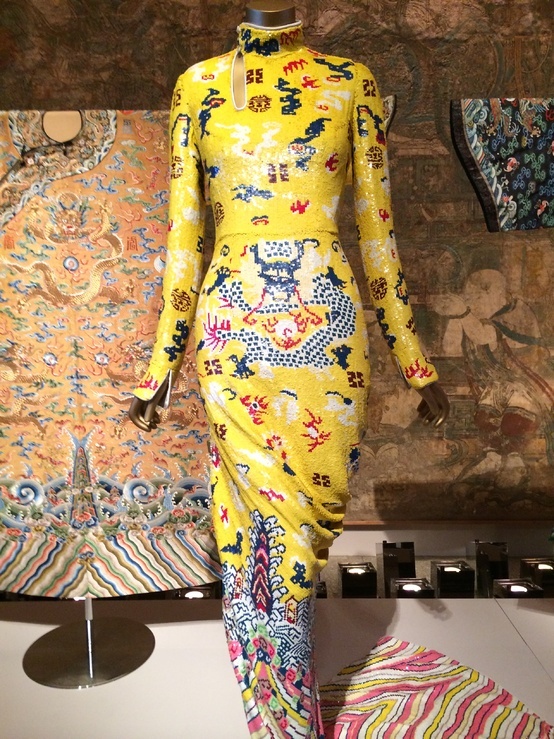 The impact that Chinese aesthetics has had on Western fashion and the extent to which China has fueled the fashionable imagination for centuries, was explored in a show entitled: China – Through the Looking Glass, at the Metropolitan Museum of Art in 2015. The Met Gala Opening (2015) saw celebrities getting into the spirit. Traditional talismans like dragons, yin-yang and butterflies abounded. Jennifer Lopez poses on the red carpet with this strategically placed dragon-motif gown. 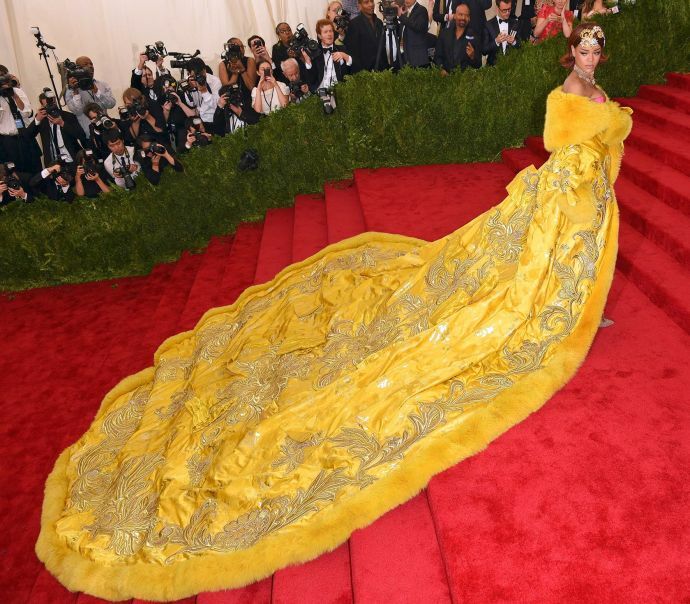 The gala was also provided a showcase for Chinese fashion designer Guo Pei, who designed Rihanna’s golden yellow gown. Pei, whose couture collection is shown during Paris Fashion Week, channels Chinese Imperialism, by utilizing rich fabrics and intricate embellished embroideries for the stars that seek out her work. 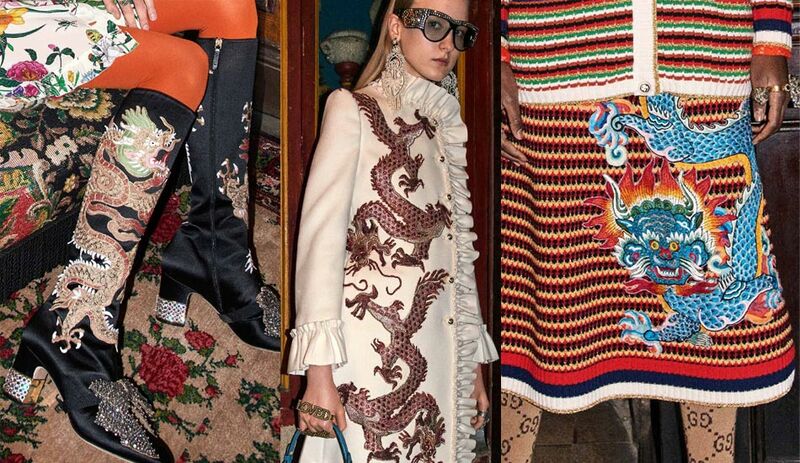 The year 2016 was a big one for Chinese inspiration as dragon motifs were favoured by designers at Emilio Pucci, Giuseppe Zanotti and at Gucci. Chinese zodiac signs also became a marketing opportunity for Western fashion designers as the Year of the Monkey ushered in a series of monkey-motifs that appeared on handbags, watches and on this studded jacket at Valentino. 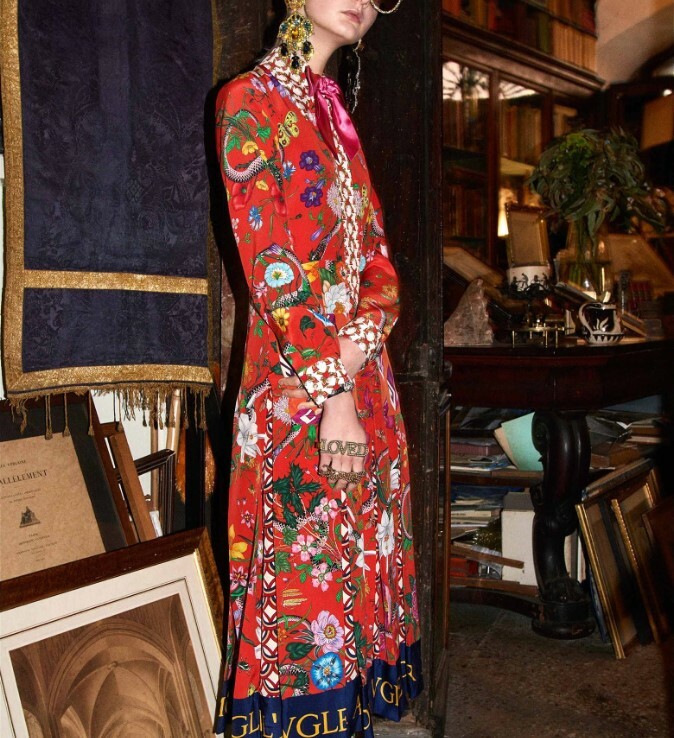 Gucci went China crazy with this updated cheongsam that featured a floral and dragon motif in a patchwork combo from their Pre-Fall 2017 collection. 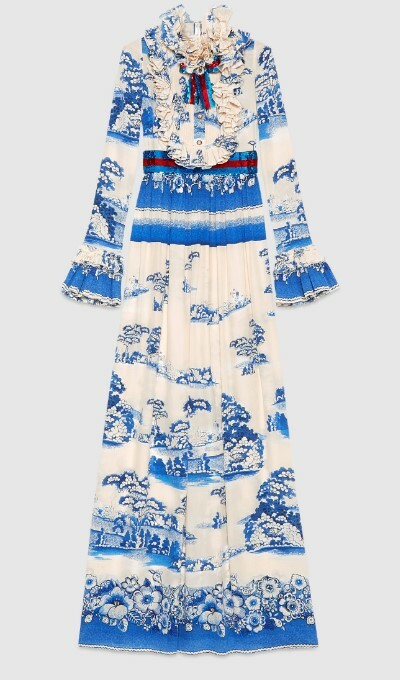 It appeared that Gucci just couldn’t get over ‘Chinoiserie Fever’ when they created this blue and white Chinese porcelain-inspired dress for its Cruise 2017 collection. China has given the Western fashion world a plethora of design inspiration and yet for a country that: comprises 19.24% of the total world population, ranks number 1 the list of countries in world population with a total of over 1.4 billion people, we have yet to see Chinese designers reach the status of a Ralph Lauren, Giorgio Armani or Tom Ford. However, stay tuned. We at UoF have our eyes set on a new group of Chinese designers that we think are about to change the future of fashion. Let’s face it…they have lots of inspiration to tap from. Ever wonder where fashion designers find inspiration? Well, wonder no more. Fashion designers don’t work in a vacuum. They find inspiration in a multitude of ways and places: through fashion forecast services, at museums, in magazines and books, on the street, at flea markets, from the music scene, in food and in nature, as a reaction to current global events and from interior design and architectural styles like art nouveau, art deco and mid-century modern. Historical fashion is another great way to adapt and infuse something new and fresh into a collection, which brings us to our favorite source of inspiration: TRAVEL. Fashion has been inspired by international destinations throughout history. Dressing, draping and dressmaking techniques have been borrowed and exchanged so many times that sometimes it gets difficult to trace back their roots. 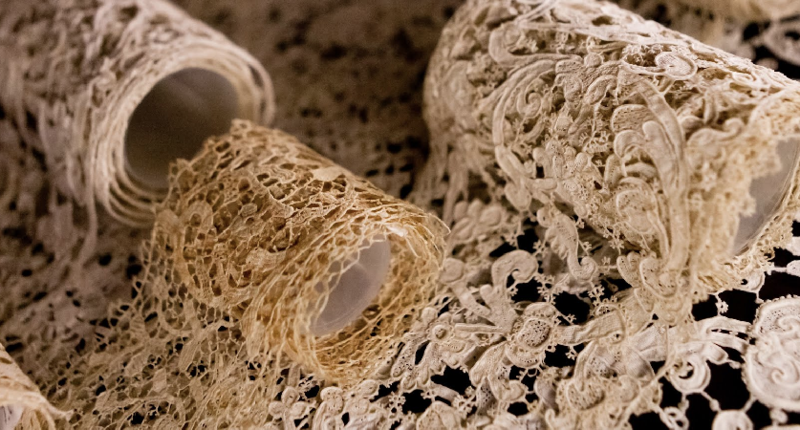 Cultural elements also get interwoven into designers’ inspiration. Once Marco Polo opened the Silk Route in 1269, he not only initiated trade between the Mediterranean countries and the Middle, South and Far East, but also inspired the borrowing and cross-pollinating of cultural elements. Designers in the western world love turning to the exoticism of the Far East when looking for inspiration. India is one of the countries. With its rich history and diverse culture, India has turned muse for many of the biggest names in fashion and continues to do so today. Paisley is one of the earliest examples of an inspiration remix and came to the west by way of the cashmere goods trade, from the Vale of Kashmir, down to India, and then to Europe. 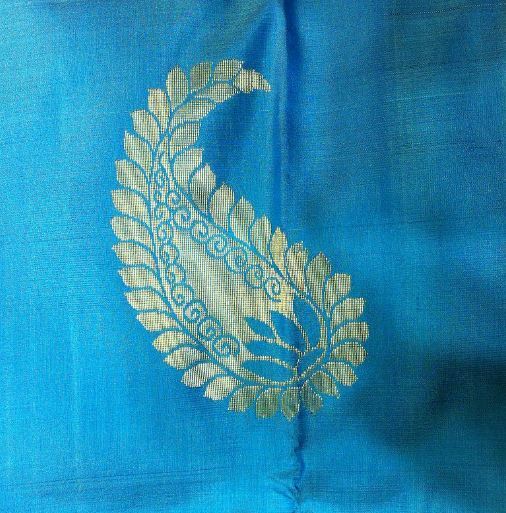 The teardrop-shaped motif, known in India as Buti, is an ancient Indian design that is still used today in Indian sarees and in the west in textiles for bridalwear, dresses, blouses, neck-ties, tunics and in home décor textiles and rugs. 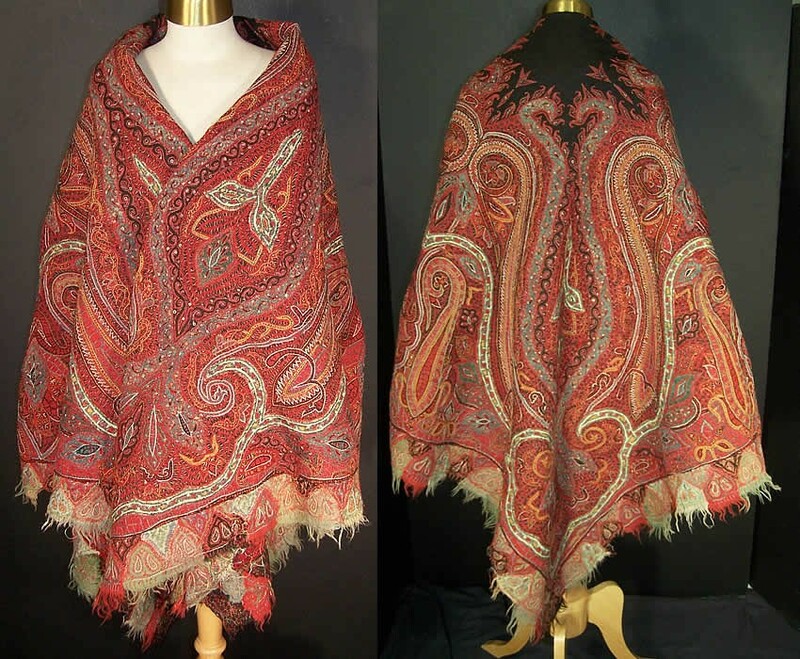 The name ‘paisley’ was given to the motif when imitation Indian shawls were copied and manufactured in Paisley, Scotland during the early 19th century. By the 20th century, international travel increased and fashion designers found inspiration, especially in South Asia. An example in American pop-culture, is a scene from the 1961 film, Breakfast at Tiffany’s, in which Audrey Hepburn, who was taking a bath, had to improvise a saree-inspired gown on the spot using a bedsheet. In the contemporary fashion arena, fashion houses like Hermès, Chanel and Jean Paul Gaultier have designed whole collections inspired by Indian fashion. Jean Paul Gaultier’s Fall 2007 couture collection featured satin tunics, bejeweled turbans and even a sherwani (knee-length coat buttoning to the neck) for the bridegroom’s ‘maharaja’ look. Hermès Spring Summer 2008 women’s ready-to-wear collection took inspiration from Indian ethnic menswear with adaptations of Nehru jackets, churidar pants and bundhgalas. The collection featured saree-gowns and tunics, replete with turban-inspired headgear in metallic shades. 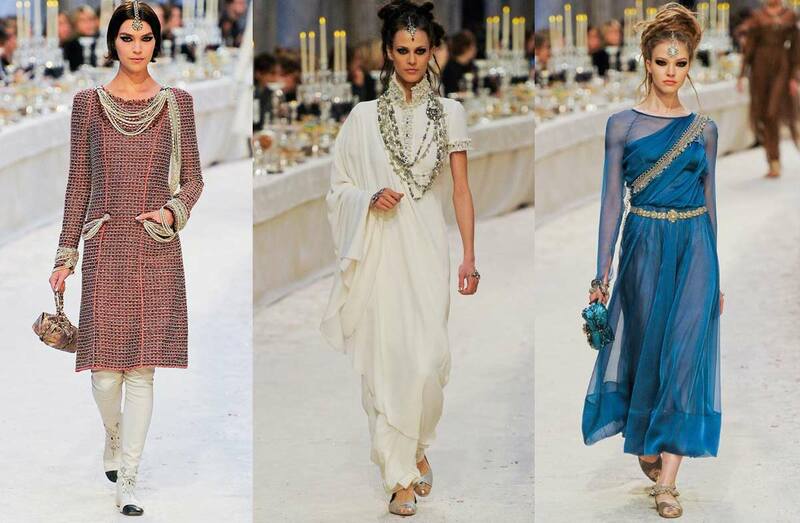 Chanel Pre-Fall 2012 collection, popularly known as their Bombay-Paris Collection, was also a tribute to India and inspired by Indian maharajas’ and maharanis’ opulent, excessive outfits, jewelry and adornments. The fashion show featured Nehru-collared dresses with embroidered hems, tunics worn over leggings and saree-drapes. Marchesa Spring 2013 collection was inspired by the vibrant Indian color palette consisting of fuchsia, peacock blue and eggplant with fine gold embroidery touches. Christian Louboutin has taken inspiration from India more than once. 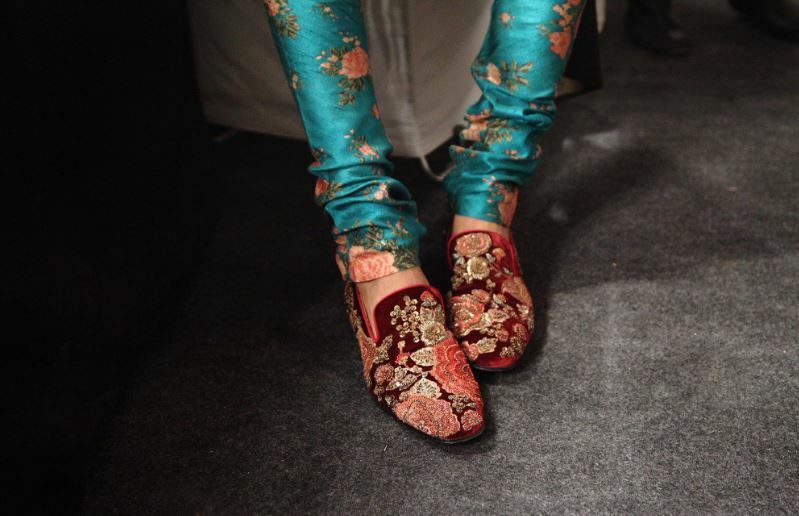 Recently, the shoe-designer collaborated with Indian fashion designer Sabyasachi to create embellished and embroidered shoes for his runway show. Many other designers have tapped India for inspiration such as, Alexander McQueen, Ellie Saab, Isabel Marant, Naeem Khan, Louis Vuitton and Vera Wang. New young designers have emerged who are also inspired by the fashion of other cultures, in an effort to bring the world together on a global basis. And with the amplitude of diversity and richness that Indian culture has to offer, much inspiration still remains to be unearthed. What’s in store for the future of Indian-inspired fashion has yet to be seen. We can only hope it’ll be even more awe-inspiring and mesmerizing than the past.